Sprocket was raised with all the privileges of a rich, proper Goldling. But everything changed on the day her beloved uncle mysteriously vanished and she constructed a battle suit and went after him, leaving the luxury and comfort of her family’s wealth behind. From that moment on, Sprocket was dedicated to fighting the forces of evil. For Generations, the Skylanders have used their magical powers and weapons to protect Skylands. But now, an evil tyrant has frozen them and banished them to earth. Only you can put them on the Portal of Power and bring them to life to save Skylands forever. Expand your gameplay experience with new worlds and new adventures. Build the ultimate army of Skylanders – with over 30 Skylanders to collect. Each Skylander has their own unique powers and abilities to enhance your game play experience and save Skylands. Conquer challenges and enemies by enhancing your Skylanders abilities with magical powers. For ages 6 years and over; EAN/MPN/UPC/ISBN: 5030917116438. 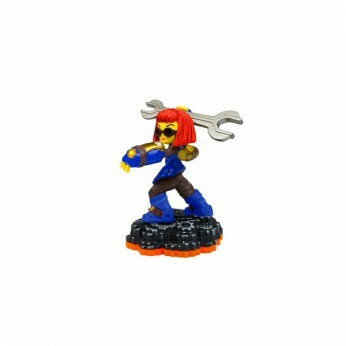 This toy costs approximately £5.24 (for the latest and best prices make sure you check our retailer list for the Skylander Giants: Single Figure – Sprocket above). In our review of Skylander Giants: Single Figure – Sprocket we classed it as being suitable for ages 8 years, 9 years, over 10 years but recommend you check the manufacturer specific advice before purchasing.